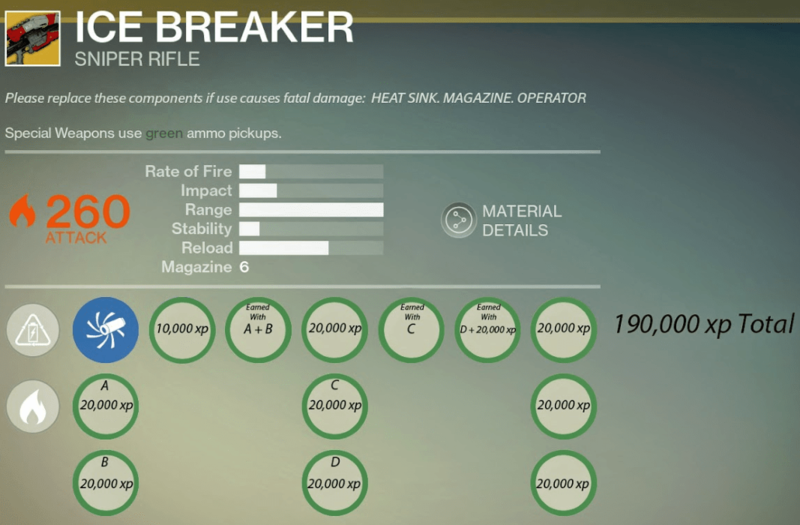 Ice Breaker is one of the two special Exotic Sniper Rifle’s currently in the game, this one deals Solar damage. The good: Regenerating ammo, high Impact. The bad: High recoil, low rate of fire. Conclusion: Excellent range, arguably the best Sniper for PvE. Ice Breaker’s victims spontaneously combust, dealing damage to others nearby. Cannot be reloaded. Regenerates ammo over time. 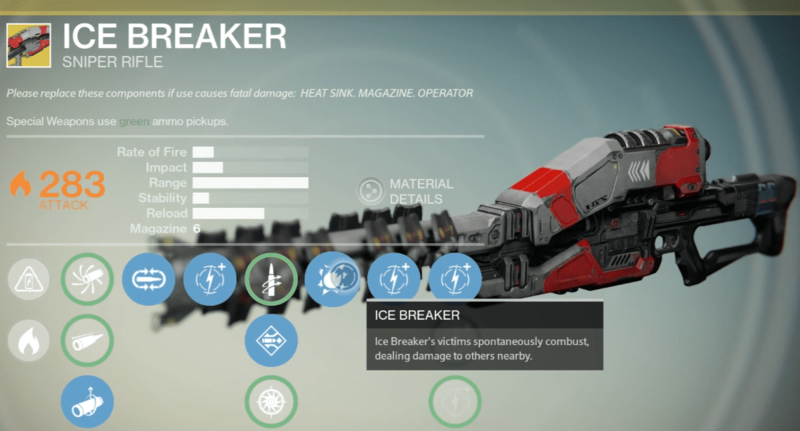 Ice Breaker is an Exotic sniper rifle that is sold by Xûr, won in the Cryptarch lottery, or as a reward for PvP/PvE. It has a unique feature similar to Exotic shotgun Invective, in that it regenerates ammo. It holds 6 rounds in the magazine, and regenerates one about every 6 seconds. This gun packs a very powerful punch and is well worth your Exotic weapon slot. Unlike the Invective, the ammo just regenerates right into the magazine, at a very consistent rate. 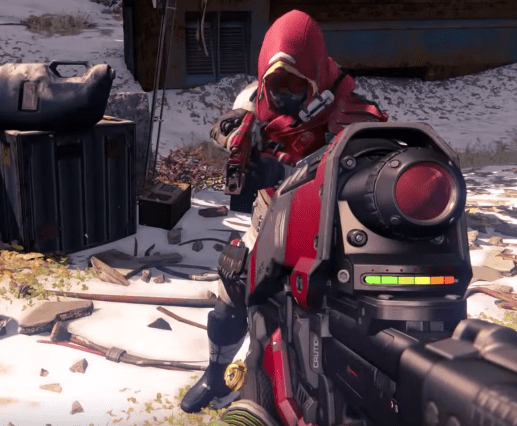 This sniper rifle also hits like it has the Traveler’s weight behind it. It has very high Impact rating, so precision shots will be rewarded. It packs quite a punch in PvP too, even if you just land a body shot. The Mulligan perk is also nice since missing a shot with this stings a little more than usual, though the chances of it happening are very slim. For example: If you’ve got Ice Breaker and another sniper rifle, you can fire all the bullets with your other sniper rifle, equip Ice Breaker & let it regen all six bullets, and then switch back to the other sniper rifle with with half of its ammo returned! The Recoil is a little extreme and the upgrades don’t help much, so you will have to take your time when firing. It’s definitely better used in PvE, because the low rate of fire and low stability will be frustrating in PvP. The scope also has a very heavy magnification on it, which isn’t a huge issue, but personally it isn’t a benefit. When you’ve got to aim for closer enemies it just makes it that much harder, especially in PvP. Quick Draw: This is for those who switch to the sniper in a moments notice. This perk is the least recommended, especially if you are a Bladedancer Hunter which can use Quick Draw anyway. If you die, the ammo unfortunately resets to zero. This weapon definitely has some character. The most apparent thing when you first equip it was the absence of the ammo indicator. I usually expect to see a number on the back or on the scope, but here we have a heat indicator disguised as an ammo indicator. It changes hues from green to red based on how many shots you have left in the magazine. The barrel has a unique look to it as well. The sound design of this weapon is fantastic. It has a very noticeable sharp sound, accompanied by a low growl as if the weapon is cooling down. If you have a good pair of headphones then turn them up and let your ears be pleased. It’s almost sounds like the shots being fired through a silencer. Having the ability to recharge ammo just cannot be understated. Especially in longer fights, such as in Nightfalls or raids, it’s an invaluable tool. Ice Breaker is one of the best, if not the best sniper rifle for PvE. Patience and Time is the other Exotic Sniper, which some prefer in PvP for its stability, recoil and rate of fire. 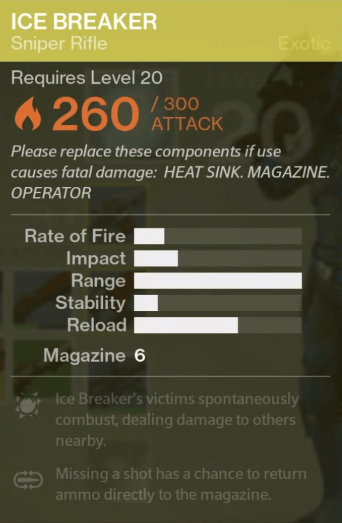 Ice Breaker’s major fault is its high recoil, and that’s about it. This weapon gets a very well deserved 9/10.